Witness the day of reckoning with the Guardians of the Abyss Scenario Pack for Arkham Horror: The Card Game! Called to Cairo to unravel a medical mystery, this pack throws you into the action of the linked scenarios, The Eternal Slumber and The Night’s Usurper, first featured at Gen Con and Arkham Nights 2018, respectively. 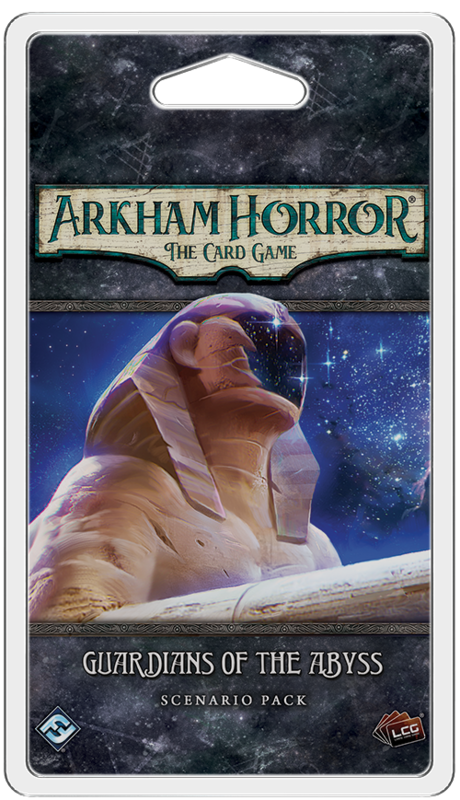 With 78 beautifully illustrated cards to immerse you in the peril of an investigation that takes you to the deserts of Egypt and beyond, this pack challenges you to determine fact from fiction, wakefulness from dream, and sanity from madness. Step into a realm beyond your imagination and stop an ancient prophecy from coming to pass! Pick up your copy of Guardians of the Abyss at your local retailer or online through our website today!